If there’s one thing that I always take with me when I travel it’s the Laura Mercier Caviar Stick Eye Colour. Summer of 2013 I visited my favorite city (ever! ), New York, and if you don’t know summers in NYC I have to tell you it’s brutal. It is hot and humid. 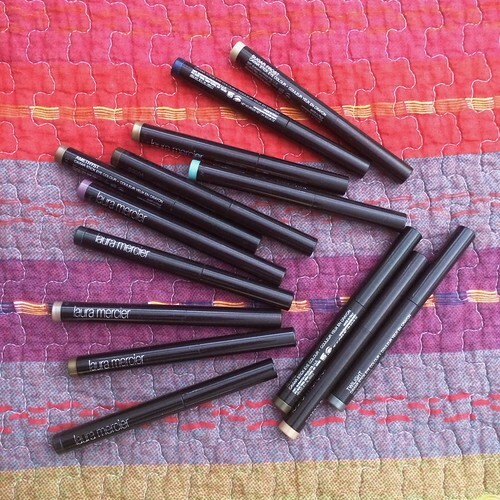 I was warned about the weather and so I brought with me Laura Mercier’s Caviar Sticks and Trish McEvoy’s 24 Hour Eyeshadow Sticks. I was happy I did as both did not disappoint. Let’s check out the shades I have in my possession. Easy to apply, just twist up and apply. It glides easily on the eyelid. There’s enough time to blend and if preferred top with powder eyeshadow before it dries out. Easy to sheer out as well as build up. My preferred method of building up is apply, blend, dry, repeat. Lasted 14 hours before I had to take it off in hot and humid weather. Can be used alone or as a base. There’s a wide shade selection however there are times when I prefer to use it as a base. They are indeed long-wearing, transfer- and crease-resistant. I highly approve of this product. 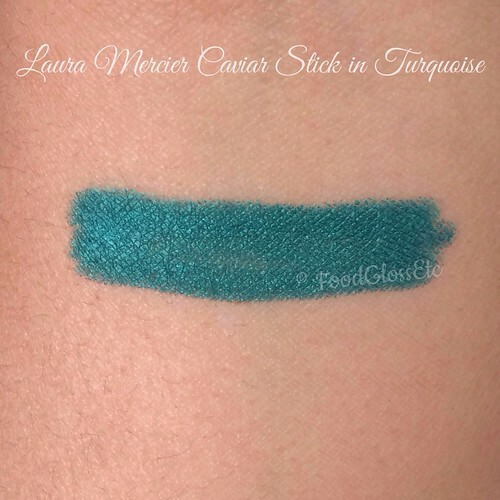 If ever you’re in need of an eye product that is easy to apply, blends beautifully, has a high color payoff, long-wearing, transfer and crease-resistant I suggest you give Laura Mercier Caviar Stick a try. Or at least check it out in the counters. Availability | Can be found at Macy’s, Nordstroms and Neiman Marcus for $26. 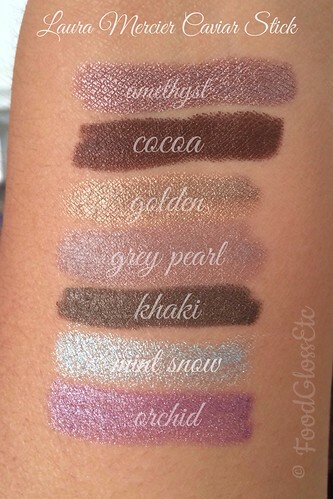 Some shades featured in the swatch picture above may be limited edition. Hey Emilie, I loooove these, too! I have Sand Glow, Grey Pearl, and Khaki so far. 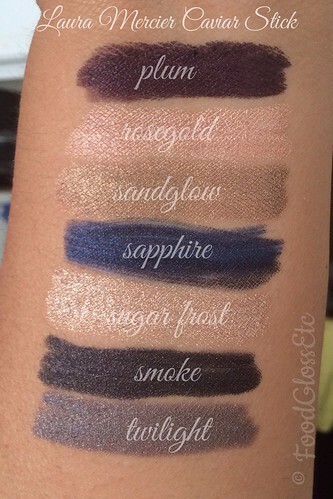 Amethyst is probably the next one I purchase! One little question: is Golden a limited edition shade? I don’t think I’ve seen it, but man what a beauty it is! Golden came out as part of a set. I can’t remember which one exactly. And you have to get Amethyst. I promise you will love it. Hello Emilie. My LM counter (Rustan’s Alabang) finally restocked these! I picked up 2, amethyst and pearl gray just this afternoon. I hope they will not disappoint! Thanks for the recommendations and swatches.